This post by Scott Nicholson first published on September 16, 2010. What has changed in publishing since he wrote this? Has it gotten any easier? Please leave us your comments! Self-publishing as an act of artistic independence, political manifesto, or corporate defiance is all well and good, but most writers have the dream of earning money from their work, if not making a career out of it. That’s where it gets scary, no matter which route you take. Industry advances for typical genre books range from $5,000 to $15,000, with more desirable upper-midlist books getting between $20,000 to $50,000. The more you get, the better you do, but after agent cut, income taxes, self-employment taxes, promotional expenses, and health insurance, it’s clearly a struggle even for those edging toward the top. Now imagine how hard it is to make that much without a publisher. Making $2 an e-book on Amazon, you’d have to sell 15,000 a year to even dream about doing it full time, living uninsured in a garret somewhere and eating bread crusts. And since many indie writers are selling their books for 99 cents, and making 35 cents per sale, they would need to sell 100,000 copies a year. That’s a lot of readers, and if you could appeal to that many, it’s likely New York would have bought your book in the first place. But here’s one great advantage where self-publishing makes financial sense: all your books can be in print and earning you money at the same time, which is rare in the world of major publishing. In fact, New York has a vested interest in making sure your book gets moved to the side to make way for its next bull rush of bestsellers and new product. That's why books are carefully scheduled and why books of equal quality are a coin flip when it comes to acceptance and rejection. If you have 10 books out, you only need to sell a few copies a day of each to consider making it a career. You can do that with e-books, but with paper books, you’ll never get the chance, because there’s not enough bookstore shelves in the world to carry books that sell so few copies. It's also a logistical nightmare, and we've reached the point where selling a book in a bookstore is not only the most difficult method possible, it's also the one that earns the writer the least money. If you want to self-publish today, you need to think electronically. And you need to forget everything you thought you knew about the publishing industry, because it not only doesn’t apply to you, it is now your competition. You will have many advantages over New York, especially in competing on price and availability. You don’t have to worry about corporate strategy, the stable of writers and editors, the sales staff’s approval, the well-placed chain book buyers’ enthusiasm, or the release schedule of your imprint’s stars. All you have to worry about is reaching your readers. And you need to repeat that personal transaction thousands of times. I know three people who will make six figures off their self-published work this year. One is Joe Konrath, always held up as the exception but he’s only an exception because he quickly figured out every writer is an exception. He had a New York career. The other two writers never published anything until they put up their e-books last year. One had been getting steadily rejected since 2003, and now those same books are about to buy him a house. His name is J.R. Rain and I’m currently writing a book with him that will be out in November, because I’d like to pay off my house, too. But I know a lot about indie publishing, sales rankings, and income. 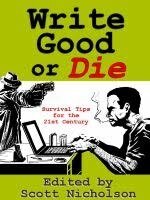 Most indie writers are selling one e-book a week, maybe two. Others will sell 10 in a year. Seriously. But that part is up to you, and up to your reader. Maybe that one reader will like your work and tell someone else, and you have two readers, and then four, and then thousands. It will be no easier to make money self-publishing than it is in traditional publishing. But how much has traditional publishing paid you in the last decade? That’s probably the only question you need to worry about. I’d rather have 100 percent of a little bit than zero percent of a theoretical gold mine. Remember what I said about your advantages over New York? Now comes the disadvantages, but that's another story. In the next installment, we’ll look at what it takes to get self-published, including finding editors, a print designer, cover artists, and an e-book formatter. Yes, if you do it on your own, you either have to learn all these trades or find good freelancers. Good article, thanks. One minute I'm convinced I'll stop playing the rejection game with traditional publishers and the impossible hoops writers have to jump through and go the indie route. The next I lose my nerve. Articles like this help me be more rational in my thought-processes. BTW this is NOT to tell you not to submit to New York agents and editors if that is your dream. It's a lot easier for someone to give you one big check than for you to make thousands and thousands of tiny sales, and New York can still do great things for you. It's just that they are going to do it for fewer people. If you can be one of them, you should do it. This is great food for thought, Scott. The reality is that huge numbers of writers can be "published" now——but it's a different game. Like the rest of the world, our industry has undergone major changes and is still very much in flux. Opportunities abound, and along with them may come major disappointments. We have to learn the rules. Certainly, not everyone wins, but the playing field is far more level that it used to be. Thanks so much for all the great information, Scott. And I really like the fact that you are not slamming NY while presenting the options in publishing. The folks in NY are not our enemies. What many writers seem to totally overlook is that writing is a business. If you're going to be intimidated by the "impossibility" of reaching a large number of readers and selling your books, frankly, you should be in some other business. Write as a hobby. Whatever. Indie authors need to approach this the way any other self-employed business person would. Think of the four P's--product, price, placement and promotion. These principles apply just as much to books as they do to shoes, furniture or cars. Or music CDs or art. Any product of any sort, really. Not that I'd know anything about it. My novel, IDENTITY CRISIS, is just the #1 hardboiled mystery on Amazon. (Not to gloat or anything. :)) And I can assure it didn't get there through negative thinking on my part. Scott, thanks for the solid and honest advice. Self-pub or not? It really depends on your goals. I just published my debut novel independently this year. I tried a few agents, then gave up fairly quickly. I have always enjoyed doing things on my own and since my aim wasn't to make tons of money but rather to reach readers and make my book available to those who are interested, I figured I'll give it a shot. Rather than spending my time, composing countless queries and getting back those bland rejections (or nothing at all), I invested my time in finding a good editor (Scott Nicholson). I formatted an ebook and a paperback version, had an artist friend help me with the cover, and put the finished books on Amazon. That was the easy part! PR and distribution is another story. No, I haven't made tons of money but I did find quite a few readers. Promoting my book has put me in touch with other independent authors and all in all, it has been a very satisfying experience. I am working on a second novel, which I plan to publish independently as well. The down-side? I will probably never be able to make a living as an author, but for me that's okay. I'm old enough that this doesn't matter anymore. I won't see my books in bookstores and I can live with that. If you are a young author just starting out, it may be worthwhile to wait a few years and find an agent/publisher. There are definitely advantages to that. But if you are crazy and adventurous enough, try the independent way. Hey, what do you have to lose? Well, that's the very question you have to ask yourself. Good luck with whatever you decide! It isn't for everyone, that's for sure. But lots of people give up too soon. Genre, timing, different types of promotion - it all has an impact on sales. The beauty of publishing independently is, you can see the changes instantly. You can see what gives you a boost and what doesn't work. You can change your tactics and price at any time. I haven't published a novel yet (still working on editing) but I have two short story collections out. One sells about 5 a day, the other about 10 a month. The exact same methods but hugely varied results. Not only does it take time for a book to be remembered, sometimes a book just doesn't work out as well as others. So you keep working on the next one and still benefit from residual income and maybe the next one will pick up and boost the sales of the previous one. As Debbi said, it is definitely a business. You have to go into it preparing to work hard and build a good reputation. You made some excellent points, Christa. As a great-grandmother who didn't publish my first book until I was past 60, I relate well to not waiting for that big-house acceptance that might never come. And while a mind-boggling number of books now hits the market each year—–in the enormity of those numbers, we find incredible treasures that we never would have enjoyed if the writer had not self-published. Hi Linda Lane. Yes, that's exactly my situation. I have always been an avid reader. I studied comparative literature in college, but I started writing seriously rather late in life. Now, I find myself in this interesting position as "grandma," surfing the internet, blogging, scooting around social media, making fun of my great-nephews and great-nieces who are there, and doing all those things young people do nowadays. And it's been fun! Facebook "Like" button! Pressed in my head. Thanks for more info on e-publishing, Scott. We all need to do our homework before we make decisions, and articles like this are very helpful. For new stuff, I still want a traditional publisher and (hopefully) an agent. But for my older out of print work (already edited and published in hardcover, audiobook, and paperback), I'm jumping on the e-book bandwagon. Can't wait to see how it turns out. When one of my publishers decided to expand to the Amazon markets, they upped the price so that we authors would make the same royalty as we did from the publisher. IMHO this killed all my sales. People, especially those buying digital want free or cheap, and as you said, a little bit of something is better than a lot of nothing. I have 4 short stories on Smashwords. Two are free, two cost 99 cents. The download ratio is something like 100 to 1, and from that, the actual purchase of those who have downloaded the sample drops again. (The Kindle store won't let authors give away their work, so it's only my pay-to-read stories that are there, and sales are even lower than at Smashwords. I'm deciding whether it's worth the effort to put up my out of print novel. Marketing, promotion, finding readers...those aren't my strong points. I'd rather be writing. Terry, I believe if you are going to go self-publishing, you skip EVERYBOY-large, small, mid, trad, Wacko-newbie-revolutionary Press whatever indie commune, etc. You really need to be able to control your own price to control your business, content, and career. The only exception is if someone is paying you a lot of money. You can't "sort of control" your own fate. Frankly, that risk and loss of control is one of the things a publisher is paying you for. Talk to any Dorchester author and see what happens when you have nothing and the ship goes down with your cargo on it. The bottom line is YOU have to be your own industry. Debbi said it. That means everything. On the other hand, if you are a Little Red Hen type, it works out quite nicely because you get exactly what you deserve. FYI, the FB button is under each post, and the Share button from AddThis in the right sidebar. The FB Like button is for a related page at FB and ours is a little-used group that I'm killing before too much longer, so no point in adding a thumbs-up widget. It just didn't seem to work for our bloggers here to have a FB page. Why can't we try everything? Sounds like a great series, Scott. I'm looking forward to each new post. What kind of book are you and Rain writing? Fiction? Scott - yes, if you're only going to self publish. However, way back when I signed my first contracts, there was no such thing as a Kindle, and the publisher had all the e-rights. That was where they made their money. Putting the books in print was an option they controlled. They sold them through their own store. Yes, I could ask for the rights back, but I haven't seen a lot of people clamoring for my stuff. At the moment, I'm not ready to take those novels back, which means I'm partially self-published, with my new offerings, but also "publisher-published" with my original books. I have decided to self publish for all the reasons shared here. I am glad to read this post. We all need to pay attention to the current situation in publishing and we all need to be the best writers we can be. So much good information here. Thanks, Scott, for another thought-provoking article. Good article, Scott. The biggest hurdle in self-publishing an e-book, in my mind, is not so much writing the book, getting it edited, paying for cover art, or the logistics of getting it listed in all the right formats and posted for sale on all the right websites--all of which are hard. No, it's finding ways to promote that book so it stands out in the sea of electronic books that are vying for the reader's attention. Traditional publishing can't die soon enough for me, and I say that as someone who runs an online used book store with my partner. I sell and give away e-books, with total downloads (some free, some not) of 10 to 12 per day. I don't make a living at it yet - currently I do that by writing web content for others - but I hope I will someday. Like you said, the advantage of having everything in print at all times should be a good long-tail strategy. I hope it is. Nice article. As fast as e-publishing is changing, this info all seems current to me (although I'm pretty sure Terry Odell's career changed greatly since her comment!). "It will be no easier to make money self-publishing than it is in traditional publishing. But how much has traditional publishing paid you in the last decade? That’s probably the only question you need to worry about. I’d rather have 100 percent of a little bit than zero percent of a theoretical gold mine." I think there has been huge change in just the last year, and I'm guessing Scott is making a living at the writing game! I know that our own Maryann has shared some information about how much she has made on e-books. But authors are very circumspect about stating numbers. What is so bad about saying you sold $2,999.99 in books last month at .99 a pop? Or I got my royalty statement and here's what I earned. I'd like to see some comparisons between traditional and self-published authors. Here's why I think you won't get that comparison, Dani: In marketing, success breeds more success, so perception is everything. If I put myself forth as an award-winning author (because I got first place at a conference contest) and amazon best-seller (because one week I gave away my book for free, which by the way has the same name as James Patterson's most recent release, so sales that week were great), who is in great demand (because I begged libraries in three states to let me talk for free, and because I begged all my friends to let me post for free on their blogs for my blog tour), and I just can't keep my book in stock (because I order only five on-demand copies at a time) — then people will continue to come to see what they're missing out on. In such a case, honesty is not the best policy. My guess is the big guys will tell you numbers, but those struggling will not. Because we all know this is what guerrilla marketing looks like in 2012. LOL, Kathryn, that is funny! I hate the whole "numbers game' because it immediately becomes about measuring egos and "quality," as if whoever sells the most is the best writer and best human being, which is absurd. Ninety percent of this is luck, and the other 10 percent is luck pushed by persistence. Three months after my original post in September 2010, I resigned my job and became a full-time fiction writer. It can be done. Now the whole "Indie vs. trad" debate is boring to me. Indie works for me. And can work for others. But, I admit, I got lucky. That's all. What has changed in two years is that thousands of indie authors are making a living selling ebooks, and hundreds (me included) are making a good living. Of course, the market is more competitive than ever, but Amazon is offering more promotional tools, so the playing field stays pretty level. Leaving my publisher and going indie in 2010 was the best thing I've ever done. Great discussion. I self-published my novel last spring after years of pitching it. It's doing well enough, getting a great review in PW Select and winning a 2012 EPIC ebook award in March for historical fiction. I've concentrated on libraries and book clubs for promotion as well have the book version in some indie bookstores and shops. My Kindle sales are small. My book sales at Amazon are growing every month. That royalty is really nice. And I"m still pitching a novel to NY agents. Living uninsured in a garret and eating bread crusts ... I'm feeling like my privacy has been violated! Kathryn, you really ought to join the BBT Cafe for the new school version of publishing. Lots of other writer forums are telling an upbeat indie story, and old school publishing is eating a lot of dust these days. I don't see this snowball slowing down anytime soon.